Tire & Auto Service Center opens its new self serve auto repair shop at 67 Capri Lane. 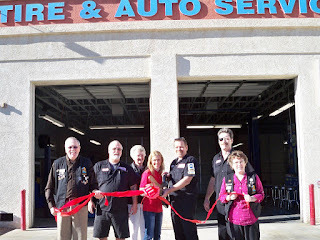 The Lake Havasu Area Chamber Ambassadors held a ribbon cutting to celebrate. Attending the ribbon cutting from left to right were Gene Appedaile, Mike Behm, Sandy Sikes, Judy Miller, Tim Miller, Mark Schmidt and Monica Hall. The self serve shop will cater to do it yourselfers and auto enthusiasts. Customers will be able to rent their dream shop by the hour; it will include a lift and tools. Tire & Auto Service Center will still provide full service auto repairs at 62 Capri Ln but now offer a repair option for all types of customers. For more information contact them at (928) 855-8473.